Almost 20 years after first documenting the extent of seahorse trade in Viet Nam, we returned to see what, if anything, has changed. You may remember that exports of Hippocampus kuda were suspended in 2013 by the Convention on International Trade in Endangered Species of Wild Flora and Fauna (CITES) after Viet Nam failed to prove that trade was not damaging wild populations. Viet Nam was also the first country to receive a global export trade ban for marine fishes. 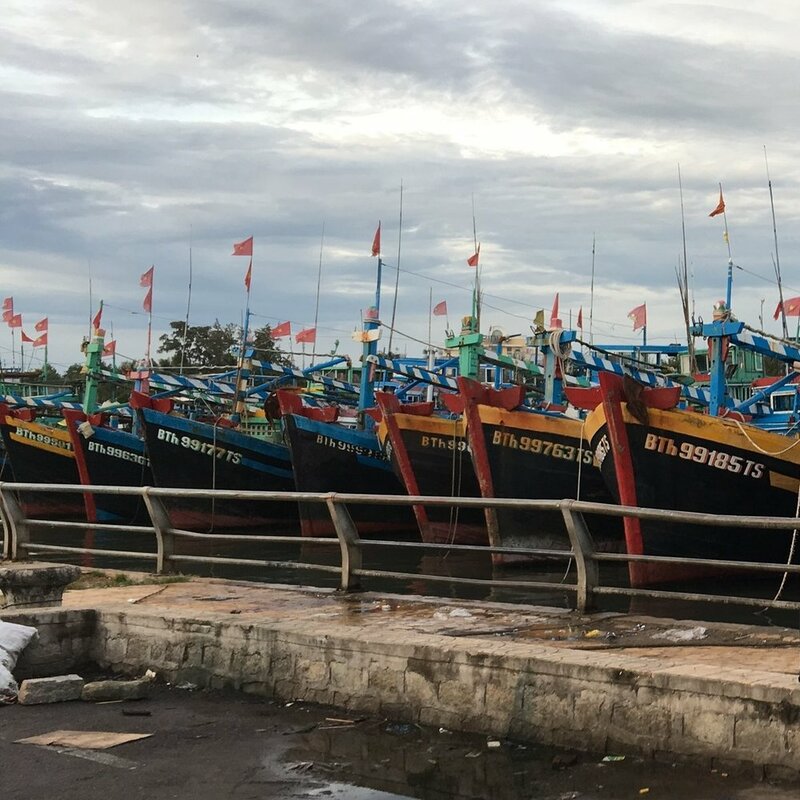 A variety of boats sit and wait in Xuan Dai Bay, Phu Yen Province. Trawl boats are in the background with a traditional basket boat in the foreground. Photo by Do Huu Hoang. Trawl boats lined up along the harbor of Phan Thiet, Binh Thuan Province. Photo by Do Huu Hoang. 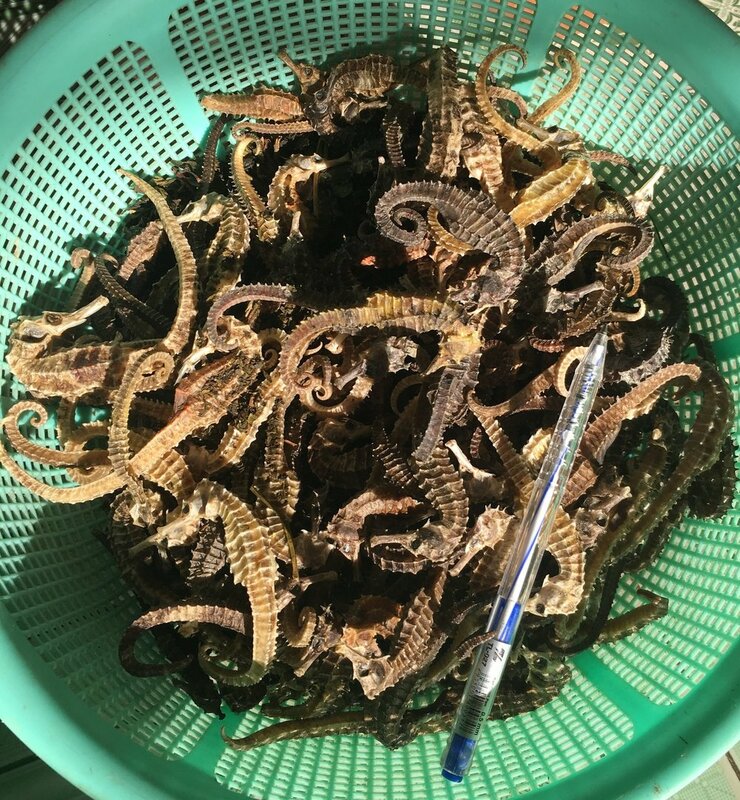 In our quest to support Viet Nam to sustainably and legally export seahorses, we interviewed over 146 fishers, buyers and aquaculturists in eight provinces across the country in 2016. We found that seven different types of fishing gear caught seahorses, primarily as bycatch - electric shock, seine nets, crab nets, pair trawls, basket diving, diving, and single trawls. The majority of fishers used single trawls but it was the pair trawls and basket divers that took the largest numbers of seahorses out of the water every day. You may be wondering what a basket diver is or you may have never heard of pair trawls? So, let us divert for a moment to explain: basket boats, called thung chai in Vietnamese, are small circular baskets made of bamboo that are used by divers to manually paddle to a fishing area. Pair trawls are similar to single trawls except, as their name implies, there are two boats dragging one large net across the bottom of the ocean floor instead of one - causing a massive amount of habitat destruction and increasing the bycatch of all species, including seahorses. We estimated the national catch to include ~16.7 million individual seahorses per year - an astounding increase from our estimate of 2.2 million from the late 1990s. And those destructive pair trawls we described earlier - they alone accounted for 75% of our estimate, four times more than single trawls. Bags of seahorses being sold at the market in Nha Trang, Khanh Hoa Province. Sold dry, a kilogram of seahorses will fetch over $1100 Canadian Dollars. The ones pictured here are being sold as pairs for $6, depending on size. Photo by Do Huu Hoang. What’s more alarming is that none of this catch is being monitored or regulated, nor is the trade of seahorses. Although not necessarily new, domestic consumption and national trade was found to be surprisingly high. Seahorses hung to dry on strings or grouped together in plastic bags are commonly sold in many shops across Viet Nam to both locals and tourists. Tonics made from whole seahorses and other marine organisms remain popular - despite most fishers reporting a decline in both the catch of seahorses and their body size all while also seeing an increase in the price of seahorses over a ten year period. As far as international trade, none of the seahorse exports discovered during our trade surveys were reported to CITES. The export of seahorses, is undocumented, unregulated and hence is considered illegal. Seahorses at an aquaculture operation in Cam Ranh, Khanh Hoa province. Photo by Do Huu Hoang. Aquaculture operations in Viet Nam left our researchers asking more questions than finding answers. Breeding successive seahorse generations is a complicated task so aquaculturists rely on extracting seahorses from the wild to be able to operate. After the ban in 2013, there was a shift in declared exports from H. kuda to H. comes, however we observed no H. comes in the culture operations we visited. This naturally raises concerns over the accuracy of CITES records. A basket of dried seahorses in the Southern Province of Kien Giang. This province had the largest estimated catch of seahorses in all Viet Nam - over 14 million seahorses per year. Photo by Do Huu Hoang. We wish there was better news to report- that seahorse catch and trade had decreased or was at least showing some signs of slowing down. Instead, what we found was intense fishing pressure, despite the trade ban. Worse still our catch estimate of 16.7 million seahorses is likely highly underestimated as not every vessel, gear type and province were accounted for. Our study highlights serious concerns about the population status of seahorses in Viet Nam. The fact that seahorses are unregulated and unreported in trade is definitely a problem but the greater challenge is regulating the destructive fishing practises that land seahorses in their nets in the first place. 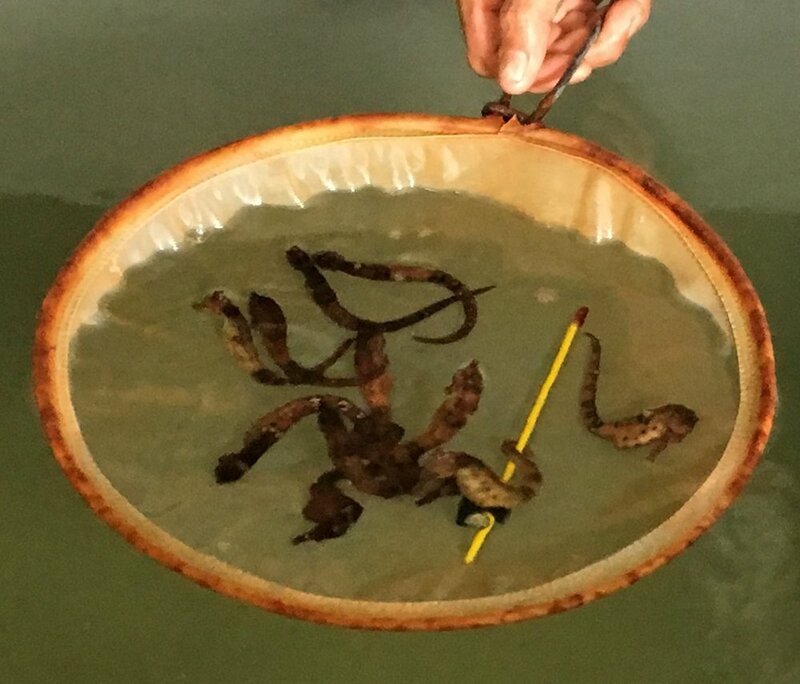 Part Two: We return to searching for clues in the catch and trade of seahorses in Viet Nam: A photo essay. Foster, S.J., L. Aylesworth, H.H. Do, N.K. Bat and A.C.J. Vincent. 2017. Seahorse exploitation and trade in Viet Nam. Fisheries Centre Research Reports 25(2): 50 pp. Giles, B.G., S.K. Truong, H.H. Do and A.C.J. Vincent. 2006. The catch and trade of seahorses in Vietnam. Biodiversity and Conservation 15(6):2497-2513.